Clean faster, easier, without chemicals! 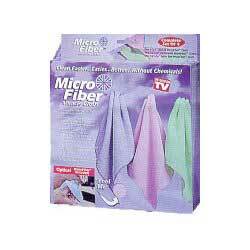 Made of super soft microfibers that go deep into the pores of surfaces to loosen and absorb dirt like magic! Soaks up 7 times it’s weight in liquids ... quickly cleans up spills. Saves you money because it works without cleaners. Wash and reuse over and over... lasts for years!